Mie Ayam (chicken noodles) at Asian Food Mart, Kippax. Photos: Elias Hallaj. Late last year many Canberrans enjoyed the food and music at the annual Indonesia festival held at the Indonesian Embassy in Yarralumla. This annual festival brings a taste of the diverse food, music, culture and traditions of the many different people who live in the Indonesian archipelago that comprises of over 13,500 islands (of which about 6,000 are inhabited). Many Australians only think of Bali or Java when they think of Indonesia, unaware of the hundreds of languages and many distinct cultures and local cuisines and traditions in the world’s fourth-largest country. It is truly one of the fascinating multicultural melting pots of the world and if you’re interested in history, cultures or languages, represents a treasure trove right on Australia’s doorstep. It has always puzzled me why more Australians don’t enjoy Indonesian food. Perhaps they don’t realise what we have on our doorstep, a multicultural feast of never-ending surprises and delicious mouth-watering pleasures. But if you can’t get to Jakarta easily, where is the best place in Canberra to try authentic Indonesian food? And where is Canberra’s best Indonesian restaurant? In Canberra, you can enjoy Indonesian food at four different restaurants, two of which are run by the same family. If you ask native Indonesians where the best authentic street-style Indonesian food is in Canberra, the first suggestion is usually Asian Food Mart. It’s a small takeaway between the BWS and the butcher inside the Kippax shopping centre in West Belconnen. The seating inside the shop is very limited but there are usually a few spare tables just in front of the takeaway. The best advice is to ignore most of the fried offerings in the bain-marie and choose a dish from the printed menu (below). All the fried food is great, particularly as an entree, but the gems are on the written menu. That said, I usually get some of their delicious hand-made spring rolls and fried chicken wings as an extra treat for me or the kids. Go straight for the written (order to eat fresh) menu at Asian Food Mart, Kippax. At my last visit, I chose the most expensive dish on the menu – the $15 Soto Betawi! Soto Betawi is a native Jakarta dish, and sometimes it’s simply known in English as Jakarta beef soup. It is basically a beef soup made in a laksa-style coconut soup with a side of rice, chilli and crunchy condiments such as fried shallots. You can see I ordered some fried chicken wings as well – couldn’t resist! In Indonesian food, Soto is a term used for many different types of soup originating from across the country – and just about every region has their own version of soto. Soto Betawi originates from the Jakarta area of Indonesia. Betawis are the original people from the region of the island of Java, which is now the same region that makes up greater Jakarta. 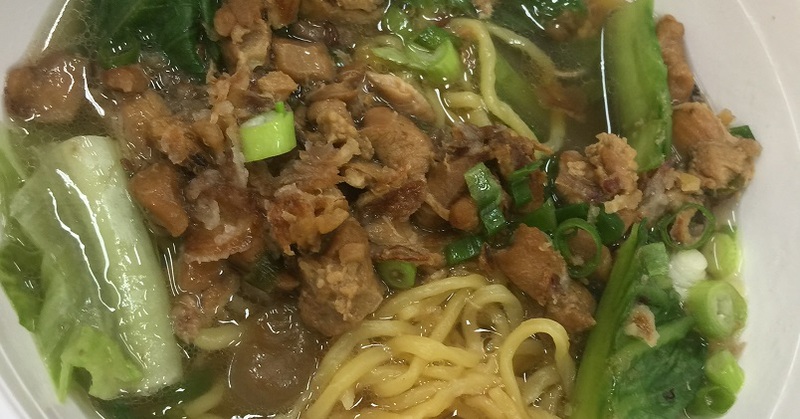 My kids usually order their favourite, Mie Ayam (chicken noodles) at Asian Food Mart in Kippax (photo at the top of this article). But there is so much to try on the menu you have no reason to eat the same dish twice. My second most regular choice for Indonesian food in Canberra is Indo Cafe. The same lovely family who runs one of the larger food stalls at the annual festival at the Embassy also runs the Indo Café at the Waldorf on London Circuit and also run the similarly named but much larger food outlet in the Canberra Centre Food Court. The food tastes great and it is authentic and fresh. They also run stalls at numerous markets around Canberra, including the Handmade Markets! 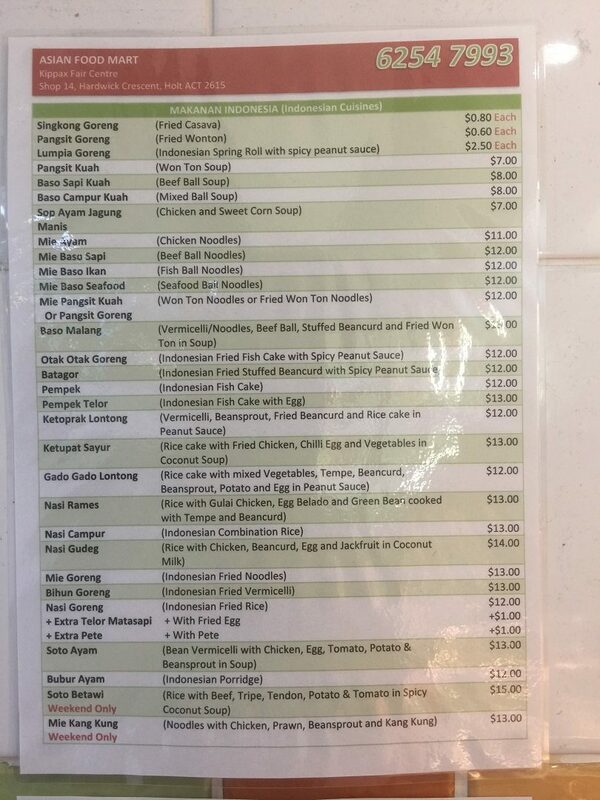 The third option that I have tried for a regular Indonesian restaurant is the Balinese Restaurant Sanurs on the Belconnen foreshore at Emu Bank. Sanur’s is the more expensive option of the three Indonesian Restaurants mentioned so far but it is a proper restaurant with table service and a full comprehensive sit-down menu. Sanur’s would be my suggestion if you have already tried the delicious food at Asian Food Mart and Indo Cafe but were after a nice romantic venue to take your better half on a special date. As diverse as Indonesia is, its people are bound by a strong nationalism and respect for cultural traditions. The love of multicultural food is one of the many things that bind the vast majority of Indonesians together as a nation. If you would like to learn more about Indonesia through its cuisines, I recommend listening to this National Public Radio interview about Prawnche Ngaditowo who is an Indonesian Instagrammer who blogs in English and is known online as “foodventurer.” Ngaditowo is of Chinese descent, but he grew up in the Indonesian city of Medan, where his father was a prawn farmer (hence his name). If you’d like to connect with the Indonesian community in Canberra you should follow the Embassy on Facebook and Twitter and get along to the numerous multicultural festivals and opportunities we often have in Canberra, to make the world a smaller and happier place. 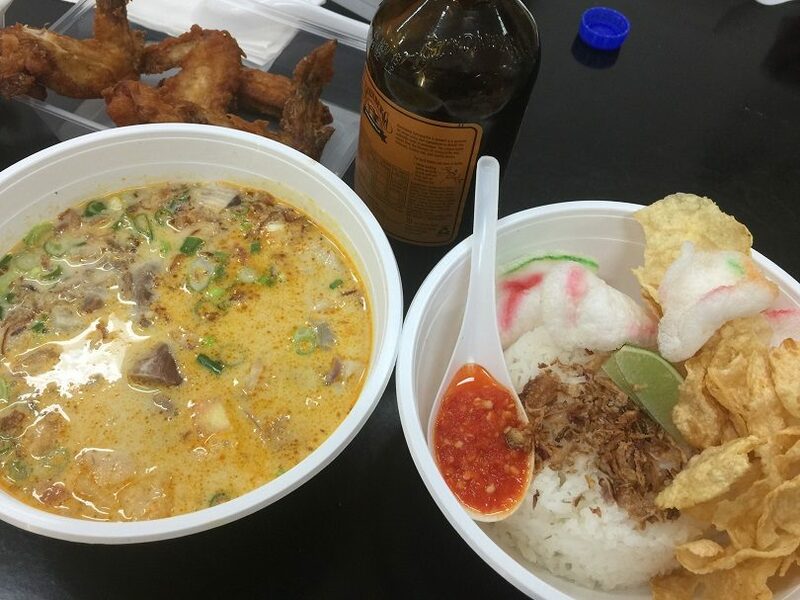 What is your favourite Indonesian dish or place to eat in Canberra? Do you have any enjoyable personal experiences with Indonesian food? Please share in the comments section below and on Facebook. Elias Hallaj (aka CBRfoodie) is a part-time food blogger and full-time political staffer who has joined RiotACT as a regular contributor. All his opinions about food are his own, except where he has borrowed them from facebook, google, instagram and twitter. If you have any tips or feedback or advice about any Asian cuisines, or other exciting things to eat around Canberra you can add a comment below or find him most nights on Twitter @CBRfoodie. Everyone should hold off on their next laksa and head to Sanur’s for a Sanur Soto - a hot and spicy soup that has amazing flavours and a huge amount of seafood, chicken, veggies and noodles - the perfect meals and Canberra’s best soup by far. I do, thanks anyway 😉. You should try them. David - Viona for the next time you visit!! Rendang daging made by my sister-in-law – her nasi lemak is damn fine too! Do any of them do Goreng Paru (Fried Beef Lungs)? It is just divine with Nasi Lemak, fried anchovies and sambal. A bit of tip, ask that the lung is cooked a bit soft and ‘squishy’ in the centre. It absorbs the flavours of the accompanying spices well and if cooked too much it can be a bit dry, almost like a jerky. I know a place in Melbourne that does it and try to get in when I’m down there but have yet to find anywhere local that has it on the menu.